You know how when you go to see a band, and the opening act is just amazing? You’d never heard of them, and weren’t even expecting to see them play. They were so mesmerizing, in fact, that you don’t remember much of the headliners. All you know is that you’ve been listening to the openers nonstop for two weeks and are checking up on their live gig schedule. And then you hear them on the radio. And their video goes viral. You think, I knew them first. The buzz around the Feb. 27 New York Times piece by Christopher Brooks, “Slaking a Thirst for Beers at Craft Breweries,” reminds me of this duality. 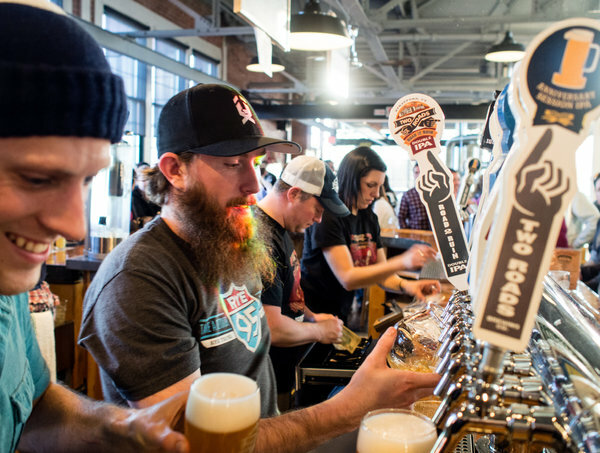 The piece covers the latest generation of Connecticut breweries that have cropped up in the past year. Firefly Hollow, Top Shelf, Broad Brook, Beer’d, Shebeen, and Two Roads are highlighted, with brief quotes from the brewers. Connecticut is a small state, and in the New England craft beer scene, it’s the baby of the group (Rhode Island counts too, but its geography throws off the curve). We don’t have established breweries that stretch to the 80s, except for BruRm @ Bar in New Haven, and an earlier version of New England Brewing in Woodbridge. So for beer geeks in this state, any ripple of change is cause for excitement, and sometimes alarm. We’re protective of our breweries. The biggest ripple — or wave, actually — has been Two Roads Brewing. Not only does it dwarf the other breweries in size and capacity, it’s already available in Rhode Island and New York. Feedback that I’ve heard about the beer is positive, and no one has complained about the experience at the beautiful Stratford complex. Those of us who care about this kind of thing were like startled night creatures in a klieg light: What’s going on here? This is all so sudden! So… startling! The fact is, brewery watchers are sensitive. We know that any lousy brewery or even “so-so” brewery could tarnish the growing reputation the state’s gaining for small, quality producers of mostly traditional styles (with a few exceptions, like Shebeen). When our breweries are discovered regionally in a world-read newspaper, it’s at once shocking and encouraging. Brooks asks a great question: “With about 15 craft breweries operating in the state, and several others poised to open, how many more can Connecticut support?” The state law from two years ago that allows breweries to sell beer from their facilities is probably a big factor in the explosion (we’re talking five or six breweries in two years… that’s what counts as an explosion here). It’s a question that’s obviously impossible to answer, and the piece doesn’t really explore the question in any depth, which is too bad. I haven’t done much to answer it either in my columns about new breweries. Personally, I think we can support at least 10 more, especially if they start cropping up in the northwest and southeast corners. It’s funny how we’re prone to either brag about a good thing or worry about its demise. If there’s any world in which we should just hang out and enjoy the renaissance for however long it lasts, it should be beer. And we should enjoy it with whomever chooses to enjoy it with us. This entry was posted in Craft beer scene and tagged Beer'd Brewing, Broad Brook Brewing, Firefly Hollow Brewing, Top Shelf Brewing, Two Roads Brewing. Bookmark the permalink.